Beijing 2008: The cost of gold // What price for an Olympic Gold? How much would you pay? How much is an Olympic Gold medal worth? I guess that depends who is answering the question…to an athlete, it’s a lifetime of achievement, or perhaps endorsement deals worth millions, a lifetime of fame and contentment. If you’re a national government like that of China, then every gold medal represents your “statement” of superiority to the world. But can it be quantified financially? Is there a price tag associated with an Olympic medal? It turns out that while difficult to quantify, it can in fact be done in some cases. The graph below shows the number of medals won by Australia at the Olympic Games between 1980 and 1996, with a projection on the number of medals that would be won in 2000. The x-axis is the money spent in each four-year cycle leading up to the Games. 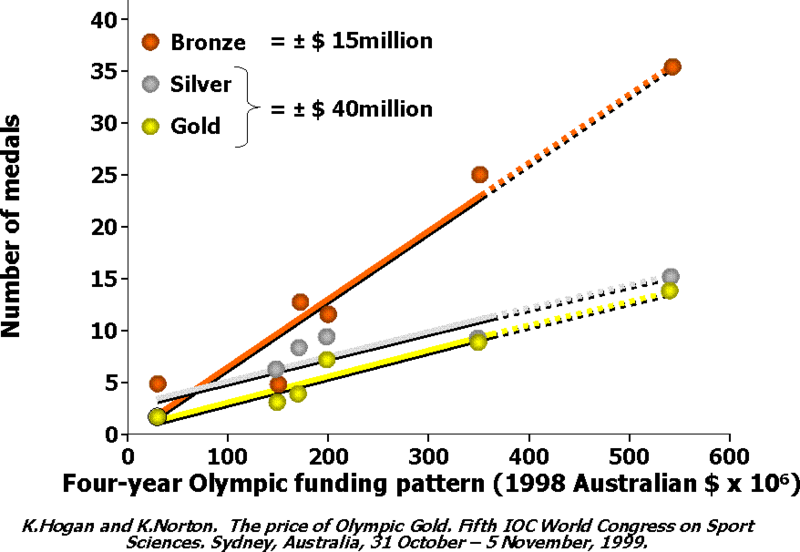 This analysis was presented at an IOC Congress in the months leading up to the Sydney Games of 2000. What you will see immediately is a nice, linear relationship between the number of medals won and the money spent during a four-year cycle between Olympic Games. The bronze medals lie on a slightly different ‘line’ to that of the gold and silver, but it’s possible to work out, using the slope of the line, the approximate cost PER MEDAL. It turns out that each bronze medal will set you back a cool Aus $15 million, while gold and silver will cost you about Aus $40 million! I must stress that this price is “context-specific”, and depends on the nation and how that money is spent. Money can be wasted, or it can be invested wisely, and the return on spending depends on the system in which the money is spent. Some nations invest little and win a great deal, but it’s because their resources and sporting structures are entirely different. So this cost is the Australian-price. In Cuba, for example, Olympic medals cost a lot less, and if you reshuffle the Olympic Medal table, then Cuba tends to win the most medals per dollar (though this is expressed per $ GDP). Other countries that win “cheaper” Olympic medals include the Eastern Bloc nations, like Hungary, Bulgaria, Belarus. For the USA, it’s almost impossible to quantify the cost, because there is no state-controlled spending on sport development during the four-year cycle – the system is “privatised”. But the point is, there is a relationship between money invested and medals won. If you want 20 gold medals, then spend Aus $800 million every four years. The graph above was used to project how many medals Australia would win in Sydney – the dashed line in the graph. It turns out it was pretty accurate, because as hosts, Australia won 16 GOLD, 25 SILVER and 17 BRONZE medals, for a total of 63 medals (projection was 14 GOLD, 14 SILVER and 35 BRONZE, a total of 58 medals). They exceeded themselves by winning more silvers than anticipated – home-town advantage perhaps? What does this information mean? Well, it means that China, who have spared no expense in their question to be the dominant nation of the Olympics, are set for great things, not just in Beijing, but beyond. Anyone who saw the Opening Ceremony will recognize the investment by China into a “vision” of superiority and dominance. They reportedly had between 20,000 and 50,000 athletes in elite training camps leading into the Beijing Games. The cost associated with running these facilities, providing coaches and medical/scientific support is enormous. Yet it’s been done, in the name of “super-power” status. China will therefore be able to produce a graph much the same as the one above, and it will be interesting to see just how the rest of the world responds to the onslaught by a nation of a billion people throwing massive money into sport. As for my country, South Africa…well, let’s just say that we would probably not even make it onto the graph above, both in terms of spending and medals won! I doubt whether we spend enough to win even one single medal in the Australian model. Luckily for us, we have a “back-up” plan, which sees our best swimmers leave South Africa to go to the USA and train there. That is our best shot for a medal. It is a sad state of affairs that in order to achieve success in SA sport, your best chance is to leave the country. But that is the reality. And for the simple reason that we fail to invest, either in people or financially, I would pick that we’ll win 2 medals in Beijing.